The NHS Newborn Hearing Screening Programme (NHSP) helps identify babies who have permanent hearing loss as early as possible. These babies and their families can then get the support and advice they need right from the start. 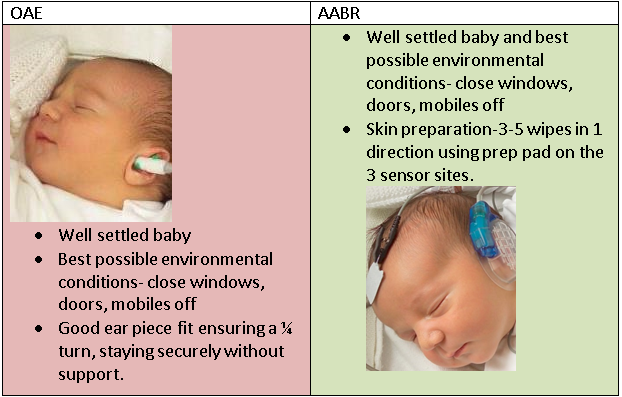 It is important we only refer those babies who need further assessment through to a hearing specialist audiology. By doing this, we reduce the workload in busy audiology departments as well as anxiety among parents. In Leicester, we screen around 10,500 babies every year. In 2014, like many NHSP sites, we noticed an increase in referrals from our screening programme for audiological assessment. In the 2013 to 2014 financial year, the rate reached 3.56%. This is a figure which exceeds the programme standard for a hospital setting. Further data analysis in August 2014 confirmed this upward trend was continuing. The standard says programmes should refer no more than 3% of the ‘well-baby’ population to a hearing specialist in audiology. These factors didn’t appear to be responsible for the increase, so we decided to proceed on the assumption that there may have been a slow erosion of performance over the years. We raised this matter with the screening team and decided to introduce a new quality improvement initiative. We called this ‘Back to basics’. We held a meeting with the screening team dedicated to the issue and presented data so they understood the situation. By looking at the screening outcome rates for each member of the screening team we were able to help target their training needs. We also asked staff to complete the NHSP annual update of e-learning and annual screening assessment and produced some simple reminders. Our ‘back to basics’ initiative started in the last quarter of 2014 to 2015. We were delighted to see that there was no further increase and that from the first quarter of 2015 to 2016 the rate started to fall. Our current referral rate is 2.3%. The team responded to the challenge in a very positive way and we are very pleased with the outcome of our service improvement and continue to monitor it closely. Simply going back to basics and revisiting the techniques used by all hearing screeners can really help. We would encourage other NHSP programmes to think about doing something similar. Was there a difference in referral rates between screeners? Is this routinely monitored? We have access to the audiology diary and record our screeners' initials when a referral appointment has been made. I routinely monitor screener referrals and equipment used to show any patterns emerging in the referral rates. There has not been any evidence to show high rates for one particular screener.